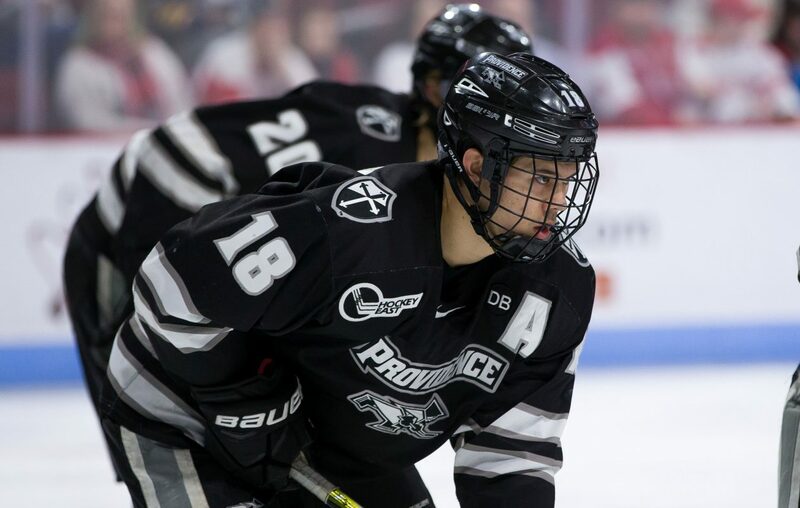 In defenseman Jacob Bryson, Providence College coach Nate Leaman said he sees the qualities of an all-American guy. But Bryson, 20, isn’t from the United States. “He’s a Canadian,” Leaman said. Still, Bryson owns a different All-American status. A splendid sophomore season in which he compiled four goals and 25 points in 40 outings earned him second-team honors from the NCAA last year. “He’s a very, very good prospect,” Leaman said. Bryson, a Sabres' fourth-round pick in 2017, 99th overall, grew up in London, Ontario, rooting for some loaded London Knights teams. South Buffalo’s Patrick Kane, who scored a whopping 62 goals and 145 points in only 58 games in 2006-07, captured Bryson’s imagination. “He was so amazing as a little kid to watch him in juniors,” he said of the Chicago Blackhawks superstar. Bryson, however, wanted to attend college, so he spent one year at a prep school and another in the junior United States Hockey League before joining Providence in 2016. The 5-foot-9, 177-pound Bryson has morphed into one of the NCAA’s top defensemen, using a mix of skill and smarts to help him thrive as an undersized player. Most defensemen, of course, are 6-foot-1 or taller. Bryson said as a 15- and 16-year-old, his coach played him at defense and up front as a winger. Leaman said nothing seems to bother Bryson, who was named an alternate captain early last season. That bodes well for a future in pro hockey. If Bryson enjoys a strong junior campaign, he could have an opportunity to sign his entry-level contract. “After the year … once I finish college stuff, we’ll see what happens,” said Bryson, whose Friars open their season Saturday at home against American International University. Bryson experienced a taste of the NHL and the program general manager Jason Botterill wants to establish during the Sabres’ last two summer development camps. “They keep it short,” Bryson said. “I think they really get to the point of development. It’s not a showcase and they try to work with us as the week goes on, just every day to get you to come to the rink and be a better player. Bryson said he follows the Sabres through Twitter and watches some games with teammate Tyce Thompson, whose brother, Tage, joined Buffalo this season. Occasionally, Bryson said he thinks about playing with Rasmus Dahlin, Rasmus Ristolainen or some of the Sabres’ other top defensemen someday. “That would be so cool to play with one of those world-class players,” he said.